The US House of Representatives has backed a healthcare bill in a step towards reforms promised by President Obama, despite strong opposition. Passed in a narrow 220-215 vote, the bill aims to extend coverage to 36 million more Americans and provide affordable healthcare to 96%. The Senate now has to pass its own bill and the two must then be reconciled before the programme can become law. He described Saturday's vote in the House as "historic", saying he was "absolutely confident" the Senate would follow suit. The bill was supported by 219 Democrats and one Republican - Joseph Cao from New Orleans. Opposed were 176 Republicans and 39 Democrats. Mr Obama said: "The United States Senate must follow suit and pass its version of the legislation. I am absolutely confident it will, and I look forward to signing comprehensive health insurance reform into law by the end of the year." But Republican representative Candice Miller said: "We are going to have a complete government takeover of our healthcare system faster than you can say `this is making me sick'." Before Saturday's vote, Mr Obama had made a rare visit to Congress to try to persuade wavering members of his own Democratic Party to back the bill. 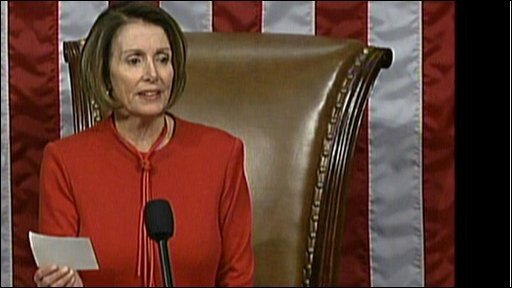 After the vote, the speaker of the House, Nancy Pelosi, said: "I thank the president for his tremendous leadership, because without President Obama in the White House, this victory would not have been possible." 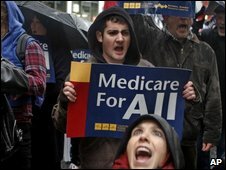 A Senate debate on healthcare reform is expected in the coming days.